The E8257D PSG analog signal generator delivers industry-leading output power, level accuracy, and phase noise performance up to 67 GHz (operational to 70 GHz). 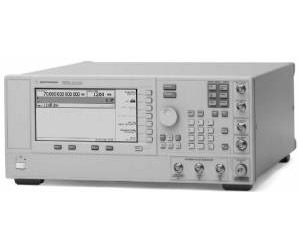 The E8257D PSG high output power and superior level accuracy often eliminates the need of an external amplifier for testing high power devices and minimizes test uncertainty to identify errors early in the design process. The world-class phase noise performance is ideal for local oscillator, low jitter clock substitution and adjacent channel selectivity tests. When testing advanced RF & microwave radar, communications, and control systems, the PSG delivers the performance you demand. Now you have more options In addition to the standard E8257D PSG continuous wave (CW) generation, optionally add analog and/or pulse modulation to accurately characterize RF and microwave components and devices. These optional modulation types allow you to minimize your initial purchase price and stay well within your current budget constraints. Customize the PSG to meet your needs Tailor the PSG for the RF and microwave test applications of today while easily upgrading in the future as requirements change. Choose from a variety of optional enhancements to configure the E8257D PSG for applications ranging from LO substitution and distortion test to radar test and interference signal generation. Price shown is for typically configured model. External control using PSA Series spectrum analyzer ? scalar network analysis capability when combined with any PSA with external source control option.